The smart way to go about fund selection, just look at the evidence! "The material in Superforecasting is new, and includes a compendium of best practices for prediction… The accuracy that ordinary people regularly attained through their meticulous application did amaze me… [It offers] us all an opportunity to understand and react more intelligently to the confusing world around us." Which exogenous or endogenous factors drive the future returns of an ETF? Do these vary across asset classes and how stable is their predictive power? Over a number of years the founders of Algo-Chain have researched a variety of trading signals and now employ these to the process of ETF Selection. So why not tap into that expertise? Determining the weights within an Asset Allocation process is never an easy task and in an ideal world would adapt to changes in the global economy. Yet in reality as not all countries are at the same point in the economic cycle it is important to track a number of macro-economic indicators to help discern where the best investment opportunities lie. Choosing when to invest in large, mid or small cap stocks remains the challenge facing every investment manager. Now there is a plethora of Smart Beta ETFs, the decision tree just got larger. 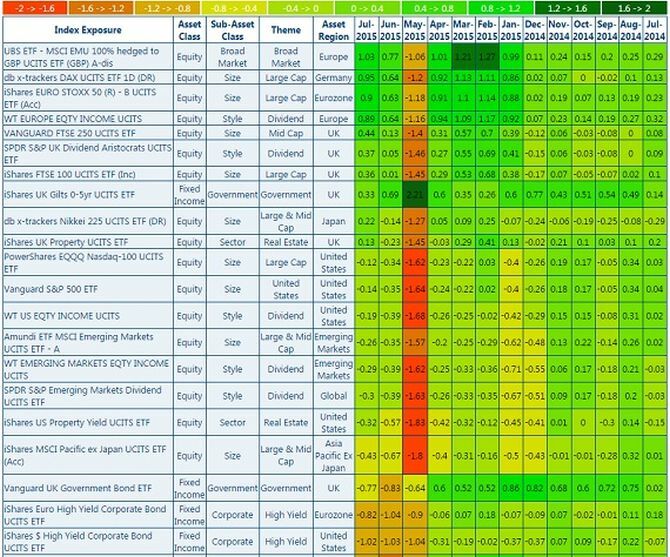 Should I invest in low volatility stocks or should I instead track a benchmark that selects those stocks with a high 'Quality' score? Welcome to the world of Factor Investing.